Doesn't a road trip sound fun right now? Fill a cooler with ice and juice boxes, make some peanut butter sandwiches, and fill up the tank. Who knows where you might end up! The open road calls to almost everyone. The number one intriguing state? Texas. Talk about getting off the beaten path. Once you're outside the city limits of Memphis and Austin, it's like a grab bag of homey small towns on rural lanes. Want authentic Texan cuisine, drive far enough and you're sure to find it. What about a barn full of forgotten antiques like they always find on those picker shows? All you have to do is go down the right road and you're sure to find one on the open plains. Hey, how about that run down house over there? There's smoke coming from the chimney. Those are people that would surely show you some real deal Texas culture if you ask nicely enough! 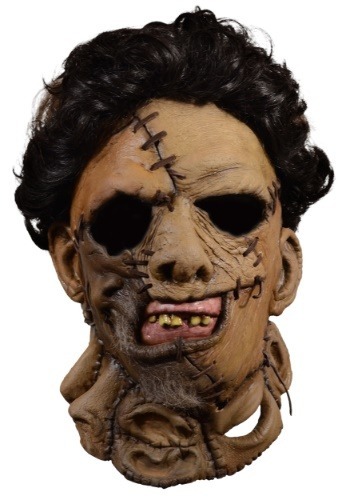 This mask pays tribute to Leatherface in the campy Texas Chainsaw Massacre 2. This mask is not crafted from human-skin but it sure looks like it is! The patches are clumsily sewn together baring a hideous set of teeth that would make any casual encounter cringe. It's topped with curly black hair that covers your whole head, allowing you to fully transform into the legendary rural killer. If the first Texas Chainsaw Massacre taught us to always have back up gasoline while traveling in the backroads of Texas, the next one taught us to. . . well it taught us to stay off the backroads of Texas! Spread the word with this showstopping mask this Halloween!